The humble toothbrush has a long history. It dates back as far as 3500BC and has evolved over time into the electric toothbrush many of us use today. The manual brush still exists as does the fundamental principle why we use them. You can learn more about about the toothbrush has developed into the products we have today by reading our article on the history of the electric toothbrush. Having considered the history, have you ever wondered how a toothbrush, be that a manual or electric one is actually made? We wondered this and have done some research to establish just how toothbrushes are manufactured today. Naturally the process may differ from brand to brand, and if the toothbrush is electric or not, but the key stages of production are similar. Years ago a brush will have been made by hand, but no longer. Sophisticated machinery allows them to be produced quickly and cost-effectively. The initial stage before manufacturing is to actually design the toothbrush. Toothbrush manufacturers and product designers will work together to create a toothbrush. The design of the toothbrush will be influenced by a number of factors, such as the intended audience, for example adults or children. It may be influenced by research be that medical or consumer trends that could affect the shape, colour and angle of the brush head. A whole host of different considerations are made during the design process to come up with a product that meets the brands needs, but is also possible to be produce. This may take a number or attempts to get something that is right and appropriate. The design and production elements all affect the cost consumers pay. More technically advanced or specialised products will often result in a higher production and resale cost. Prototypes or samples are often made to test and check certain elements of the design and production process, before tooling up for mass production. It is at this stage changes might be made if issues are found that were not apparent from the initial design and concept stages. Prototypes are tweaked until all parties are satisfied. Once agreements are made, the production line will be configured for producing this product. This includes creating appropriate molds and changes to equipment that are needed in the manufacturing process. Some brands will produce the toothbrush themselves, whilst others may outsource the production to another company. In some instances, brands buy an ‘off the shelf’ design and customise it with their logo, packaging etc. One of the first stages is actually making the brush handle. Plastic pellets or granules are placed into an injection moulding machine, which heats the pellets until they melt. Once a hot liquid a rotating screw or plunger forces the plastic into the mold. The moulds are often for the entire handle of the brush, including the small holes in which the bristles will later be fitted. These holes are called cores. The single piece moulding process makes normally for a stronger toothbrush. 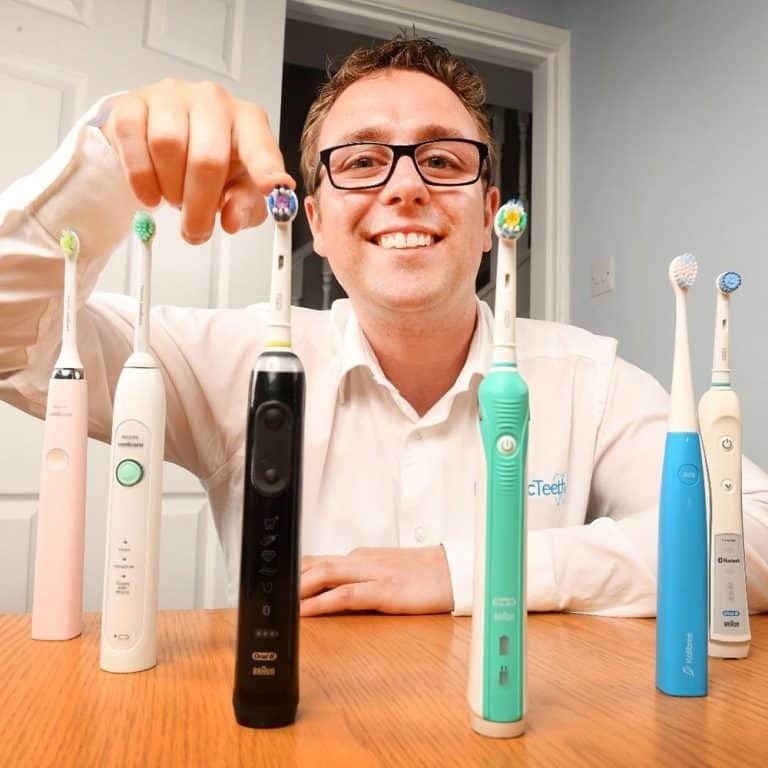 For an electric toothbrush the brush head is usually made separately (using a similar process) and the handle, larger and hollow for a motor and battery to be fitted within. Pressure often in the form or gas or air is then applied inside the mould until the plastic has cooled and formed into the final shape. Once complete small pins push the handle out of the mould and into the filling machine. It is not uncommon at this stage for computers and sensors to check each brush handle to make sure it meets the specifications desired and no faults have occurred during the moulding process. Typically made from nylon the bristles are positioned into the core of the handle or brush and secured with tiny metal staples/straps that stop them coming out. Depending on the design of the brush head, bristles may be thicker or thinner as well as softer or firmer, with a combination of such being used on some brush heads. Bristles may also be different colours for design purposes or for functional reasons. Many brushes now have fading indicator bristles, that discolour over time to act as a reminder to change brush heads regularly. Once the bristles are in place, they are normally a bit rough. They need to be cut and shaped to the manufacturers specification. A computer guided machine will guide a sharp blade, that will slice the bristles to the correct length and shape for the brush being made. Bristles are often blunted as part of this process to remove sharp edges. In some instances the bristles are cut or specifically designed to have a contour to the tip to help in the brushing and cleaning process. Rounded bristles tend to be softest and most comfortable on the teeth and gums. Brush heads are passed through a UV light to kill off any germs and bacteria, making them safe for use by you and I. 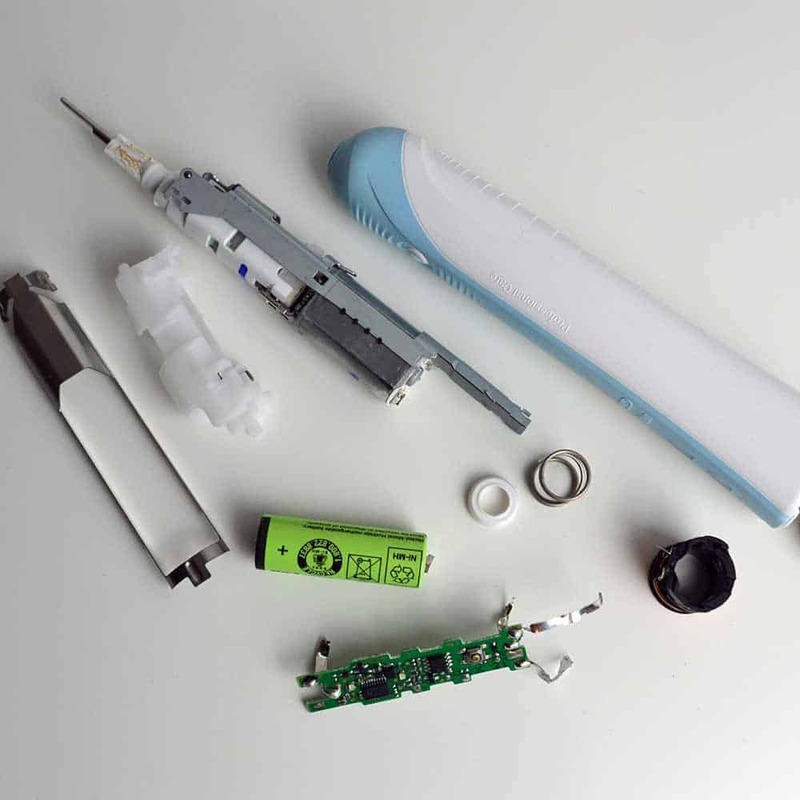 In the case of manufacturing an electric toothbrush, a motor, gearing system and battery are connected together, checked to see if they function and then inserted inside the hollow brush handle casing. The components are then sealed inside with a plastic top/cap, that forms the base of the brush handle. The toothbrush has now been produced. It then goes for packing. In the case of a manual toothbrush, this is often a plastic and/or cardboard container. This protects the brush a little and keeps it free from germs. The packaging will include all the information about the product that you and I as consumers can see and read when looking at them on the shop shelves. 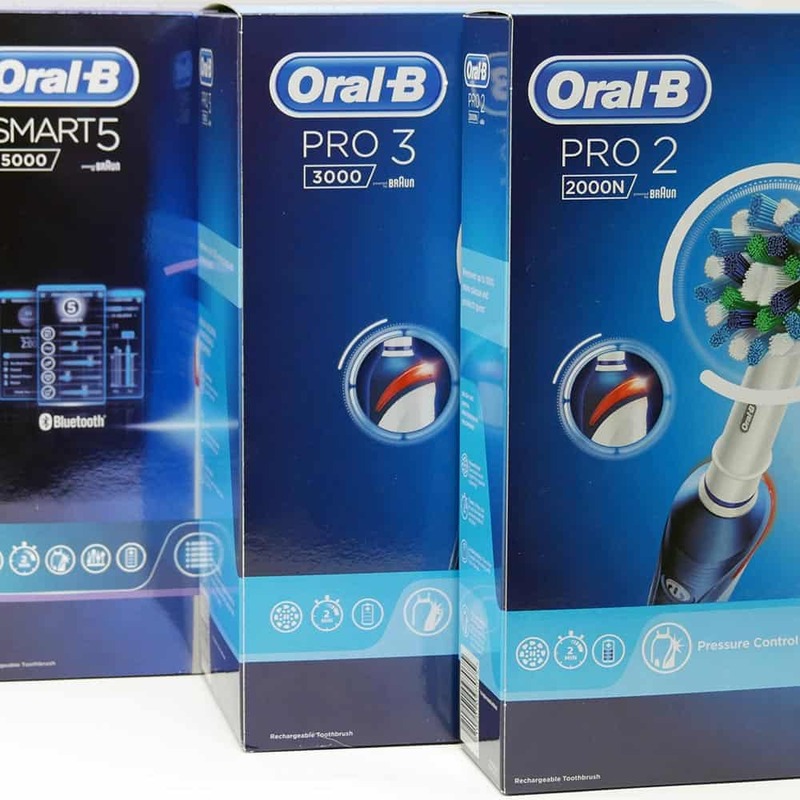 An electric toothbrush is normally packaged in a larger box, with the appropriate brush head and in many instances a number of other accessories that have been manufactured either on the same site or elsewhere. They are brought together into one box. The individual brushes are grouped into larger boxes for shipping and distribution in stores. This will vary from one manufacturer to another, but big brands will often take a batch of brushes, put them through a number of rigorous tests. Providing the samples pass this, they are cleared for shipping and sale. These are older videos, but both explains the process of production well. Good day , am trying ti fine a company to bring my new product to life, I have design a new toothbruch , I have on boads , am looking for it to come to life. Thank you for the comment. We are not a company that manufactures products ourselves. If you use our contact form to get in touch with us, sending through more information, we might be able to point you in the right direction. I have recently designed a new product for toothbrush market and have a applied for a patent. The product toothbrush, and offers a renege of benefits over current product on the market which I would be happy to outline in more detail if am given an opportunity . I am now looking at companies who would be prepared to licences or purchase my designed in order to produce and distribute the product. Jon, can you point me to right direction, for someone purchase my designed. 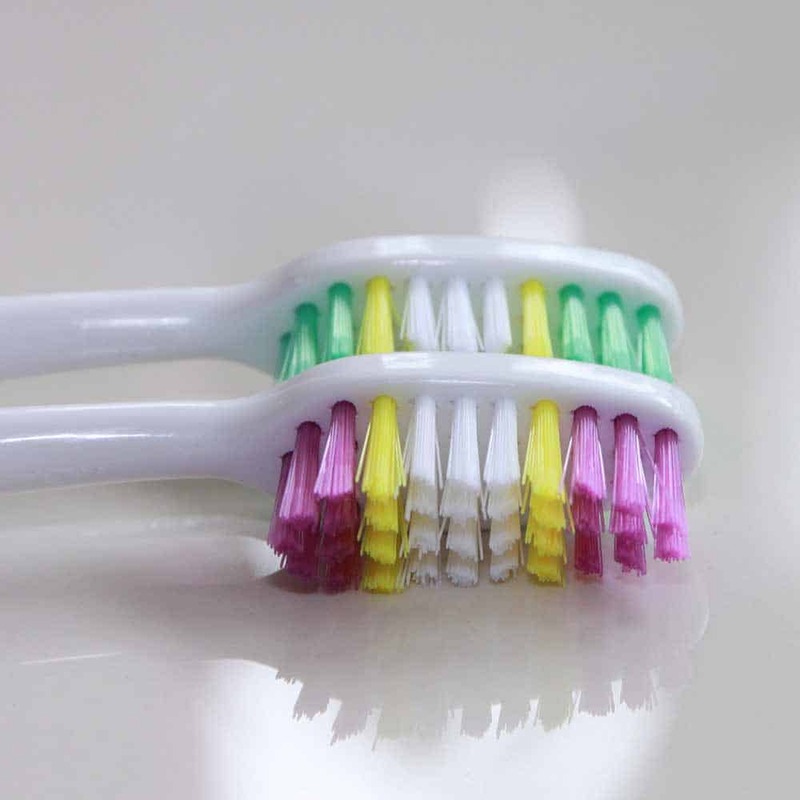 We do not have massive experience in this area, but if you use the contact page to send more details about the toothbrush and we can see who of our contacts it might be best sent onto. the toothbrush’s is electric toothbrush, it ‘s up dated to the once’s that is out there now. We do not make the toothbrushes ourselves Kandra. We do however have contacts that do. Can you give me the contacts? Please email us contact us by emailing contact [at] electricteeth [dot] co [dot] uk. We won’t share these details in these comments. Te felicito por tu investigacion, muy interesante y amena!